Recently I did a post in praise of Renault's excellent photographs of F1. The original idea was to post separately on each team but I decided against that because I would have to be rude about one or two of them - and they might not like me after that! There are things worth knowing about in this game of finding relevant photos, however, and today I thought I'd share some details about two more teams who make it fairly easy to access their image banks: Force India and Honda. Blogging is still the pariah of the media world and it can be difficult proving one's credentials to the stuffier teams, so I particularly like those who do not put too many obstacles in my way. That means the smaller and less competitive teams quite often, the big boys being very slow to understand the promotional aspects of allowing mere bloggers to use their precious photos. Both Force India and Honda have quick and simple registration procedures and they get a thumbs up from me as a result. This is a team with a no-nonsense feel to its site, without the fancy animations and videos of others, and the photos tend to follow that lead. A few arty shots are included but, generally, this is good, basic photography. This picture of Pedro de la Rosa at the recent Barcelona test is an example - an honest portrayal of the driver waiting to be released from the pit. 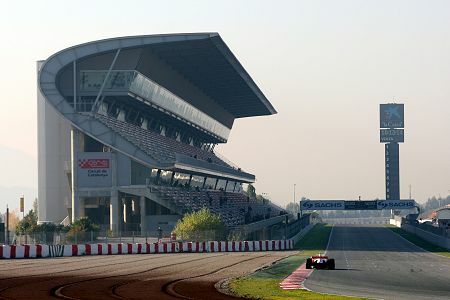 In searching for more adventurous shots, I came across this one of the grandstand and start/finish straight, also at Barcelona. It has atmosphere but not quite in the same class as Renault's moody photos. Keep looking and you can find some great photos in FIF1's image bank. Honda have one of the strangest websites of the lot - it functions in a completely different way to most, relying heavily on Java, and can be quite clunky as a result. Presentation of the photos is a bit fiddly too, requiring that you click through from just a few pics to move on to the next bunch. But there is an artist amongst their photographers and so many of the shots are taken from interesting angles and have some thought put into them. I like this close-up of the rear of the car, for instance, the photographer being much more concerned about composition than the technical details of the wing and suspension. 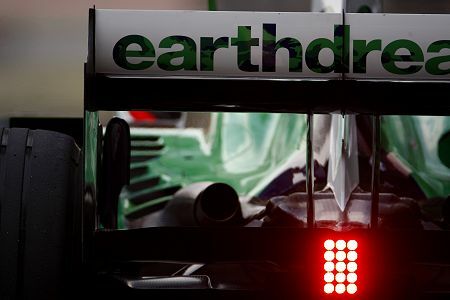 The red light is the point, of course, pinning the eye to the picture and making it possible for Honda's eco message to filter into consciousness through the advertising on the rear wing. 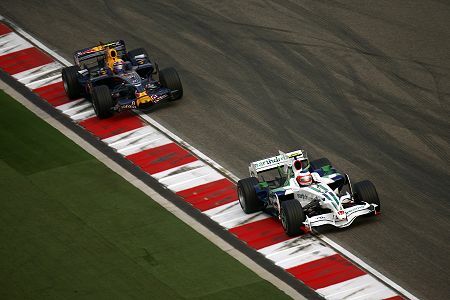 There are some good race photos as well, including this one of Barrichello's Honda ahead of Webber in the Red Bull. That was an event unusual enough to merit inclusion, I thought! Again, there are plenty of very good photographs in the image bank and they are worth clicking through to find. Some of the teams have a touch of the "Bernie" about them, don't they when it comes to the internet ! Luddite-lites, I like to refer to them as ! Indeed so, Peril - and you have an excellent word for them! 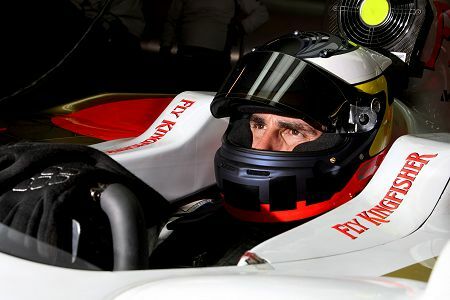 Very interesting Clive, I had no idea that F1 sites provided such great photos for free. What about the rules on uploading them to your own site? You mentioned doing some cropping and sharpening - is that sufficient to keep the Force India lawyers from getting excited? Each team has slightly different rules, Andy - it's wise to have a read of their conditions before use. Photos invariably require re-sizing before use on a blog but, as long as you don't stretch or alter aspect ratios, you should be okay. And sharpening is needed after re-sizing since it always loses some of the detail. Cropping I only do to photos from elsewhere - usually amateur photos that need large amounts of background cutting out.